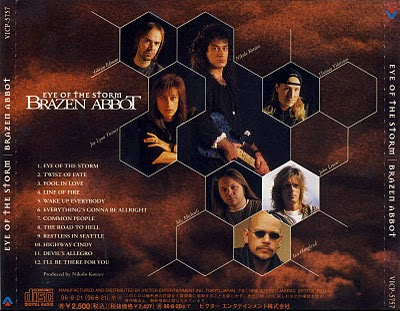 Brazen Abbot is the brainchild of Bulgarian virtuoso guitarist Nikolo "Nik" Kotzev, who currently resides in Finland. Nik created the Brazen Abbot project after exiting the Swedish band Baltimoore in 1994. The debut album was initially only going to feature one singer: Göran Edman (ex-Yngwie Malmsteen, Glory). However, due to contractual obligations, Edman was only available for two of the album's songs. Glenn Hughes (ex-Deep Purple, solo, Trapeze) was slated to record the remaining tracks, but also he was hindered by contractual obligations and could only record three songs for the album. Tomas Vikström (ex-Candlemass, solo) recorded the remaining songs for "Live and Learn", which was released in 1995 to rave reviews. Apart from the aforementioned singers, the album also featured bassist Svante Henryson (ex-Yngwie Malmsteen, Glory), organist Mic Michaeli (Europe) and drummer Ian Haugland (Europe). The three-singers-concept had turned out to be a successful experiment, so Nik decided to record the follow-up with three singers as well. Edman and Vikström returned for the recordings, and new Brazen Abbot member Joe Lynn Turner (ex-Rainbow, ex-Yngwie Malmsteen, solo) filled the third vocalist spot. Former Europe member John Levén took over the bass duties as Svante Henryson was unable to record the album due to schedulig conflicts. Haugland and Michaeli completed the backing band for "Eye of the Storm", which was released in 1996. After the tour Nikolo started working on the rock opera about the life and times of the famous French prophet Nostradamus. Opting to release the double album under his own name rather than the Brazen Abbot moniker, "Nikolo Kotzev's Nostradamus" was finally released in 2001. Featuring several Brazen Abbot members including Glenn Hughes, Göran Edman, Joe Lynn Turner, Mic Michaeli, John Levén and Ian Haugland and also Jørn Lande, Doogie White, Alannah Myles and Sass Jordan, the album turned out to be another great success, both critical and commercial, for Nikolo. After doing extensive promotion for "Nostradamus", Nikolo started writing songs for the new Brazen Abbot album in early 2002. Finally in mid-2003, nearly 6 years since the last Brazen Abbot release, "Guilty as Sin" was released. The "Bad Religion" line-up was nearly complete, except for Thomas Vikström, who had been replaced by singer Jørn Lande (ex-ARK, Masterplan). The very first Brazen Abbot concerts with a full band line-up were performed in Bulgaria the same year. This touring line-up consisted of Nikolo Kotzev - guitars; Joe Lynn Turner - vocals; Wayne Banks - bass; Lars Pollack - keyboards; Thoams Broman - drums. A live CD from these performances and a documentary DVD was released under the name "A Decade of Brazen Abbot" in 2004, Brazen Abbot's ten year anniversary. Following the release of "Guilty as Sin", John Levén, Ian Haugland and Mic Michaeli rejoined the reformed Europe and were thus unable to appear on future albums. As replacements for the fifth Brazen Abbot studio album, Nik hired Blaze bassist Wayne Banks (who also appeared on "A Decade of..."), drummer Mattias Knutas and organist Nelko Kolarov. Edman, Turner and new recruits Tony Harnell (TNT) and Eric Mårtensson (Eclipse) handled the singing duties. Nik also decided to utilize the same Bulgarian symphony orchestra he had previously used in the Nostradamus rock opera. The result was 2005's "My Resurrection".